The purpose of this study is to make Lesson Plan using stimulant questions that emphasize the communication skills. This research uses CAR method of teacher type as researcher. Respondents from this study were 27 8th grade students of SMP in Salatiga. This research used 5 Lesson Plans with 5 materials. The results indicated that by giving stimulant questions, observers said that 89.22% students were more focused on learning indicated by active students who answered stimulant questions, supported by the results of the questionnaire where 89.34% students said that stimulant questions were in an order, logical, easy to understand, and can help them in solving various problems and the stimulant questions can improve their understanding of physics learning. In addition, the evaluation test results also indicated that 87.18% students understood the material. Therefore, stimulant questions can make students to be focused more and can make them understand the learning materials better. Amanah, A. P., Sudirman, Nely, A. (2014). Studi Keterampilan Proses Sains Pada Pembelajaran Fisika Materi Getaran dan Gelombang di Kelas VIII SMP Negeri 18 Palembang. Jurnal Inovasi dan Pembelajaran Fisika, 1(2), 137–144. Arikunto, Suharsimi. (2012). Dasar-dasar Evaluasi Pendidikan Edisi 2. Jakarta: Bumi Aksara. Eunike, Z., Pattiserlihun, A., Sudarmi, M. (2018). Stimulant Question To Help Student’s Associating Skill In Making A Conclusion. This paper was presented at International Undergraduate Conference, University Kristen Satya Wacana. Gredler, E. M. (2011). Learning and Instruction. Jakarta: Kencana. Hidayati, N., & Endryansyah. (2014). Pengaruh Penggunaan Pendekatan Ilmiah (Scientific Approach) Dalam Pembelajaran Terhadap Hasil Belajar Siswa Kelas XII TITL 1 SMK Negeri 7 Surabaya Pada Standar Kompetensi Mengoperasikan Sistem Kendali Elektromagnetik. Jurnal Pendidikan Teknik Elektro, 3(2), 25–29. Kamaliyah, Zulkardi, & Darmawijoyo. (2013). Developing the Sixth Level of PISA-Like Mathematics Problem for Secondary School Students. IndoMS. J. M. E, 4(1), 9–28. Machfiroh, A., Pattiserlihun, A., Sudarmi, M. (2018). Skill In Designing Experiment Using The Stimulant Question For junior High School Students. This paper was presented at International Undergraduate Conference, University Kristen Satya Wacana. Marjan, J., Arnyana, I. B. P., & Setiawan. I. G. A. N. (2014). Pengaruh Pembelajaran Pendekatan Saintifik Terhadap Hasil Belajar Biologi dan Keterampilan Proses Sains Siswa MA Mu’allimat NW Pancor Selong Kabupaten Lombok Timur Nusa Tenggara Barat. E-Journal Program Pascasarjana Universitas Pendidikan Ganesha, 4(1), 1–12. Nindya, S., Pattiserlihun, A., Sudarmi, M. (2018). The Ability To Observe Experimental Results Through Stimulant Questions For Junior High School Students. This paper was presented at International Undergraduate Conference, University Kristen Satya Wacana. Permendikbud. (2013). Jurnal Lampiran Peraturan Menteri Pendidikan dan Kebudayaan Republik Indonesia No. 65 Tahun 2013 tentang Standar Proses Pendidikan Dasar dan Menengah. Jakarta. Prabowo. (2011). Metode Penelitian (Sains dan Pendidikan Sains). Surabaya: Unesa University Press Riduan. Primananda, Y. A. (2017). Peningkatan Keterampilan Eksplorasi Dengan Model Pertanyaan Stimulan Bagi Siswa SMP di Salatiga. Makalah dipresentasikan pada Seminar Nasional Pendidikan Sains PPs Unesa 2017, Surabaya. Putra, R. S. (2013). Desain Belajar Mengajar Kreatif Berbasis Sains. Yogyakarta: Diva Press. Sisdiknas No. 20 (2013). Sistem dan Visi Misi Pendidikan Nasional. Jakarta : Departemen Pendidikan. Sunarno, W., Sukarmin, Supurwoko, & Wikara, B. (2016). Development of Integrated Science Module be based on Scientific Approach in the Connected Integration to Improve of The Students Critical Thinking Skill. This paper was presented at International Conference On Teacher Training and Education, Sebelas Maret University. Wahyono, Abdulhak, I., & Rusman, (2017). Implementation of Scientific Approach Based Learning To Think High Levels In State Senior High School In Ketapang. 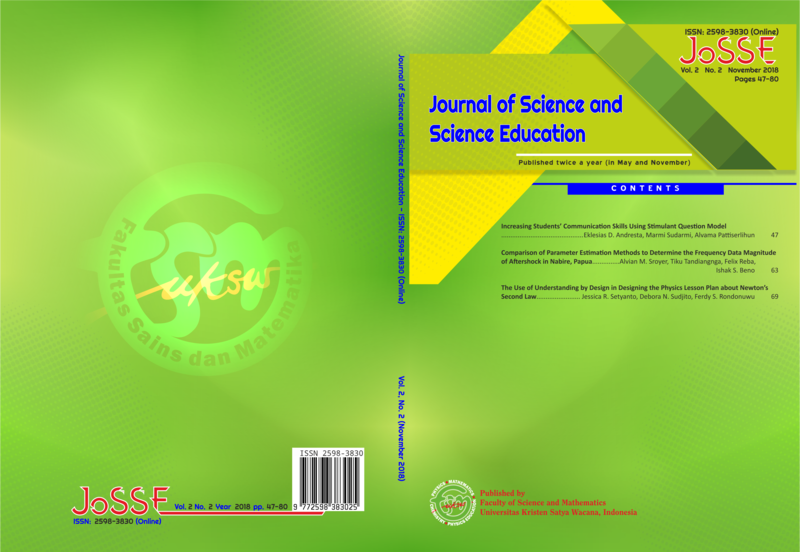 International Journal of Education and Research, 5(8), 221–230. Yusmanah. (2012). Peningkatan Keterampilan Bertanya Dengan Menggunakan Metode Penemuan Terbimbing Dalam Pembelajaran Matematika. (Program Sarjana Universitas Tanjungpura), Pontianak.